Not all carbs are created equal, but most have a time and a place in your diet. Learn the difference! A rose is a rose is a rose, but a carb is not a carb. Carbohydrates are the primary fuel source for your brain, heart, nervous system, and muscles. But there are good ones and not-so-good ones. Choosing one type of carbohydrate over another can lead to increased energy, decreased hunger, and good health. Or it can lead to energy spikes followed by fatigue and hunger. Highly sugared cereal, white rice, white breads, white pasta, candies, chips, cookies, cake—they all taste great, and they're all carbs. But so are smarter choices like oats, brown and wild rice, quinoa, couscous, barley, whole-grain breads, fruits, vegetables, and sweet potatoes. Guess which of these are better sources of essential vitamins, minerals, and fiber? Cookies, cakes, and chips? Not so much. Whole-grain foods, fruits, and vegetables deliver a powerful one-two punch of nutrition and slow-digesting fiber. Together, they help keep your energy high and your appetite in check for hours. These "good" carbs are called "complex carbs." Simple carbs, on the other hand, are nutrient-poor. What they lack in vitamins, minerals, and fiber, they try to make up for with sugar—and lots of it. After you eat simple carbohydrates, your blood glucose quickly spikes to give you a burst of energy, then falls off the edge, leaving you feeling tired and hungry. 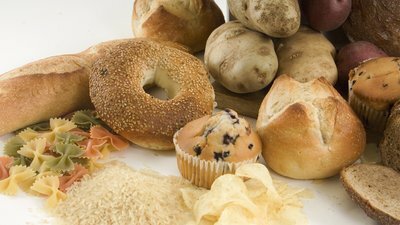 There can still be a place in a healthy diet for some of those not-so-good carbs. If you need a quick hit of energy 15 minutes before your workout, loading up on a bowl of oatmeal probably isn't the best idea. Sometimes a quickly digested, low-fiber carbohydrate like a cookie or muffin (or maybe even some "good" dried fruit) will get you that immediate jolt you need.